With littleBits Space Rover Inventor Kits, kids can create their own rovers and use them to perform various space-related tasks, such as collecting rock samples and searching for signs of alien life. A new robot kit lets kids build their own rovers to learn more about technology and the spacecraft used to explore other cosmic bodies, like the moon and Mars. 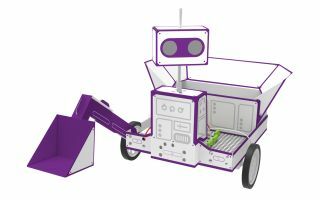 The littleBits Space Rover Inventor Kit includes the electronic building blocks for kids to construct their own rovers and control them using a smartphone app. Available today for $199, the kit comes with 19 different parts for building the robot and 15 "bits," which are electronic pieces that snap together magnetically to make the rover run. The collection of color-coded bits includes motors, sensors and a battery. Instructional videos for building the rover, as well as other "missions" or educational activities, are available using the free Android or iOS littleBits Invent app. Also, online video tutorials and educational courses are available on Jam.com. The littleBits Inventor Kits re designed to inspire kids' own passions for STEAM (science, technology, engineering, art and math), littleBits said in a statement. "We [littleBits] want to empower kids to invent the world they want to live in," Ayah Bdeir, founder and CEO of the company, said in the statement. "We are inspired by this generation's desire to help others, improve their communities, or break new barriers in music making and space science. Our newest line of products is designed to equip them with what they need to understand how technology around them works, get excited about STEM/STEAM and use invention methods to make their creative ideas happen." After building the base of the space rover, kids can add on other features, including a rover arm, a space hammer for "crushing rocks," a cargo carrier and super scooper, solar arrays, and a motion detector. Using these different add-on features and household objects, the app challenges kids to complete various activities, such as obstacle courses, space soccer, a solar-seeker project and alien life detection. The app also highlights important inventors, from NASA astronauts to the seamstresses who invented the space suit. The in-app activities "guide kids through understanding the highly competitive space race and building and controlling space vehicle inventions, like a space-rock collector or an alien-life detector," according to the statement. In addition to the space rover, littleBits released two other new STEAM kits: the Base and Electronic Music Inventor kits. The littleBits Inventor Kits can be purchased on Amazon and littleBits.com.